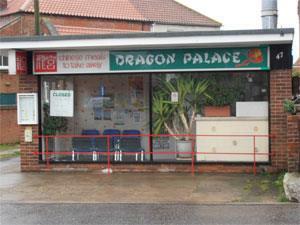 Dragon Palace in Caister-on-Sea, near Great Yarmouth is a takeaway serving Chinese cuisine. On arrival in Great Yarmouth follow signs for the A149 towards Caister-on-Sea, proceeding past Yarmouth Stadium and over the mini roundabout towards the village centre. Dragon Palace is located just beyond the next mini roundabout at Beach Road, on the left hand side.